Path Valley is situated in the South Central part of Pennsylvania in Franklin County between the Tuscarora mountains on the West, and the Knob, Rising, and the Connococheague mountains on the East. The area was originally known as the "Tuscarora Path" by the Indians because of their early travels through the valley. The valley includes the townships of Metal and Fannett township, and the villages of Fort Loudon, Fannettsburg, Willow Hill, Spring Run, Dry Run, Doylesburg, and Concord. The Pennsylvania Turnpike crosses Path Valley just above the village of Fannettsburg. In the center of Path Valley, a branch of the Doylestown Stream has its beginning from three large springs that start at the area known as Doylestown, and runs North into the Narrows Branch of the Tuscarora Creek. Also from the springs, the Sink Stream runs towards the South into the Dry Run Creek. There were a few pioneer forts established in the valley with no military value but were used only for the safe housing of nearby families. One such pioneer fort is said to have been in existence by stories handed down through the generations and was located on the hilltop near the three springs where the early Doyle families settled. The compiler has not found any written proof of the pioneer fort but local history books have written that quite a few of the forts used by the settlers were never written about during the early days unless a notable event occurred at the fort. Usually the event would have been a tragic one. The site of the hilltop where the early pioneer fort was located was later used as a limestone quarry and cement furnace where stone blocks were made and used to replace the original log dwellings of the early Doyle and surrounding area families. Today the quarry and furnace site has been deteriorated by the weather and time, and is overgrown by trees and brush and very little of it, if any is recognizable. 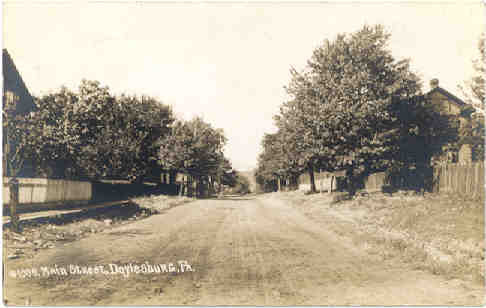 The village of Doylesburg was laid out on April 24, 1852 by Philip Thomas Doyle, and it was named in honor of his ancestors. The survey plot drawing of the village consists of 26 lots (60 ft wide by 120 ft long) laid out along a Main Street with two cross streets, Market Street, and North Street. Two years later on May 23rd 1854, Philip was named the first postmaster of Doylesburg. In 1858 the village of Doylesburg had two Churches. One of Catholic denomination and the other of Methodist. Doylesburg also had a store which was built and operated by William Doyle, a flour mill which was run by Edward W. Doyle, and a tannery which was owned and operated by William and James McLain. Today Doylesburg still has the two Churches and the general store with Post Office. The Post Office was operated until July of 1996 by Elizabeth Best, daughter of Judith Agnes (Doyle) Best and was in their family for the past 67 years until June of 1998. Before the formation of Franklin County in 1784, all the land West of the Susquehanna River still belonged to the Indians. The first Doyle settlers came to the valley around 1737 and settled in the area now known as Doylestown. All the early settlers that settled in the area were in violation of the agreement between the colonial authorities and the Indians. Thomas Doyle and Samuel Bechtel were the first two settlers to warrant land in the Path Valley area. At that time the land was noted as being in Lancaster County. Thomas obtained the land warrant from the William Penn family on November 29th 1737 for 400 acres of land. It was located a half mile to the north of the tract of land warranted to Samuel Bechtel. On December 30th 1737, Thomas had his land surveyed by Zach Butcher, the deputy surveyor. The land after surveying was totaled at 530 acres and was located between the Tuscarora Branch, now known as Doylestown Creek and Sink Hole. Land records show that Thomas Doyle never got to patent his land. He probably died of natural causes or was killed by the Indians. On Wednesday, May 30th 1750, the Magistrates of Cumberland County along with Benjamin Chambers (founder of Chambersburg, Pennsylvania) came into the Tuscarora Path or Path Valley area to expel the settlers that was in violation of the agreement between the Colonial Authorities and the Indians. Felix Doyle was one of the settlers. All the settlers were put under bond to leave the valley with their families and their possessions and were to appear at court in Carlisle, Pennsylvania to answer charges that were brought against them. Felix Doyle’s log cabin along with ten others were burned down to the ground that day. In a letter written by Richard Peters, Secretary of the Commonwealth, dated July 2nd 1750, it states...." the trespassers, most of them cheerfully and a very few of them with reluctance, carried out all their goods. Some of the cabins were deserted before and lay in waste." After the Treaty with the Indians of the Six Nations at Easton on October 23rd 1758, Felix Doyle returned back to the valley and settled on the same land that his father, Thomas Doyle, had obtained a land warrant for. Since Thomas never got to patent his land, Felix obtained another land warrant for two hundred and fifty acres of land on June 4, 1762. Felix had the land surveyed and it showed as having three hundred and eight acres of land (Franklin Co., Pa. Survey Book, Vol. 3, Page 69). On January 11th 1779 Felix Doyle deeded his land over to his son Barnabas Doyle. Barnabas Doyle served during the American Revolutionary War as a private from 1779 to 1781 in the 6th class of Captain Thomas Askey's Company of the First Battalion of Cumberland County. After the War, Barnabas returned back to the Doylestown area and farmed the land. Barnabas's will, dated October 26th 1797, states that his will was not to be settled until his youngest child reached maturity, then the remainder of his estate was to be equally divided between his children. On August 16, 1816, the estate was settled and the land was divided between Barnabas’s children. Barnabas's three sons, Barnabas, Edward, and James, was deed land, each with a dwelling and a barn. Where these three lands and farms meet is still known today as Doylestown, near Doylesburg, Pennsylvania. The early settlers of the Path Valley area were Scotch Irish, and German. They were predominantly of Presbyterian and Methodist faith, but there were some devout Catholics amongst them. Before the Catholic Church was established in Doylesburg, people from the nearby areas and villages would come into Doylesburg to a Catholic home to hear Mass from a traveling Catholic Priest. The first Catholic priest of the valley was Father Dennis Cahill who had arrived from Ireland. His first mass was celebrated at the Timmons homestead. People from the Amberson Valley area which is located on the other side of the Connococheague Mountain would walk barefoot across the mountain wearing a path which is still in existence today. A marker which reads the "Catholic Path" was placed along the side of the Path Valley Road where the path crosses. St. Mary's Roman Catholic church. Doylesburg, Pa. In 1802 a log church was built in the Doyle family grave yard that was on the property of Felix and Sarah Doyle. On November 7th 1816, Felix and Sarah deeded the land to the Roman Catholic Church which today is still known as St. Mary's Roman Catholic Church. The present cemetery in the Church yard must have been established before 1800 as is the evidence by the dates on the tombstones. Note: If you have any old pictures of the Doylesburg area that can be used on this web site, please contact me. Thanks.